Sensitive skin can be a tricky situation to deal with and can also be one of the most mystifying skin types of them all. It always confused me when a doctor or esthetician would ask me, do you have dry, oily or sensitive skin? My skin is sensitive but it’s also normal or dry… and can sometimes be oily. I think the majority of us have sensitive skin so we need to be careful with what we apply on our face. I’m sure you’ve seen a lot of serums floating around the internet and in stores this past year so I’m going to share my favorite serums for sensitive skin that I’ve been using for almost a year. If you would like to read about my current skincare routine, click HERE. 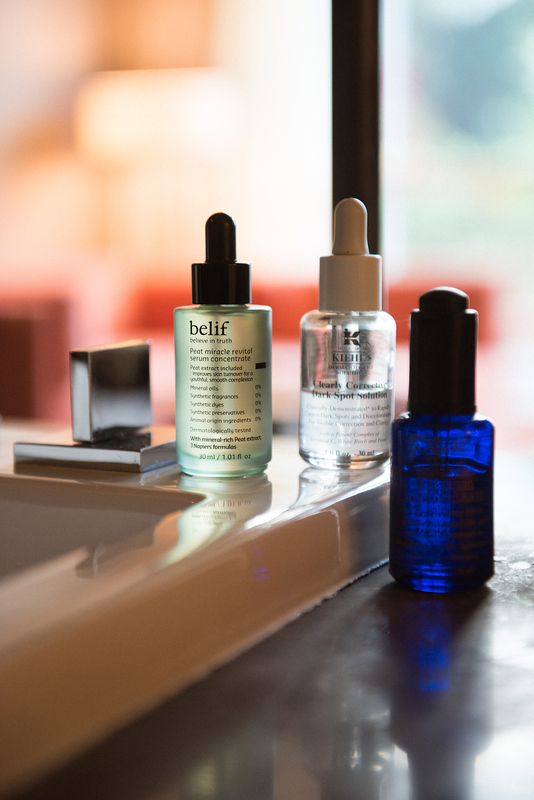 Before I break down my current serums, I want to explain why we use them. 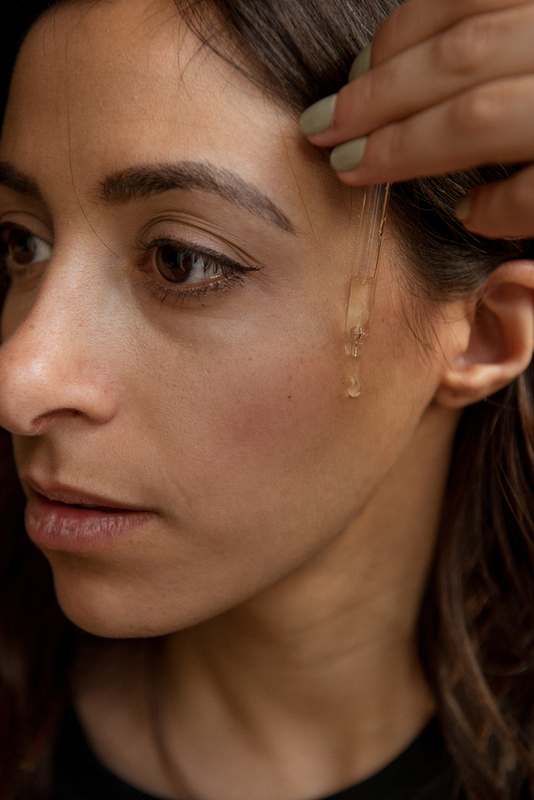 Serums are full of nourishing and hydrating ingredients that help retain the moisture in our skin. Unlike moisturizers and lotions, a serum is more lightweight and can penetrate into the skin instead of sitting on top of it. Using a serum is very simple, just simple apply 1-2 drops onto your face and gently massage into your skin. Depending on how much moisture your skin needs at that moment, you can use 2-3 drops and massage all over your face and neck. If you’re looking to use more than 1 serum at a time, I would cocktail them together in the palm of my hand and apply them to my skin. (Morning) Belif Peat Miracle Revital Serum Concentrate – To hydrate my skin after cleansing and prepare my makeup routine in the morning – A rich-nutritious ample for intense skin care including concentrated peat extracts, coming from multiple herbs aged for thousands of years with clean glacial milk in civilization-free peat land. The herb energy revitalizes the skin and cares for potential wrinkles. (Evening) Kiehl’s Midnight Recovery Concentrate* – To repair my skin as I sleep from the damages of the day – Regenerates, restores, and replenishes skin for smoother, healthier skin. Works with the skin’s natural nocturnal activity – when skin is most receptive to repairing itself from daily aggressors – to dramatically restore skin. (Evening) Kiehl’s Clearly Corrective Dark Spot Solution* – To reduce and eliminate dark spots from scarring or aging – It targets dark spots, discoloration and hyperpigmentation to reveal a more even skin tone in eight weeks. It is formulated with Activated C – derived from Vitamin C but more potent -antioxidant Peony and White Birch extract. I used to cocktail the two Kiehl’s serums together because they target different problem areas but currently, my skin does not need that much moisture at night. For the last month I’ve been rotating the 2 serums each day. Monday Midnight, Tuesday Corrective, Wednesday Midnight, Thursday Corrective and so on. I do apply a moisturizer after my serums to lock in the hydration but if I’ve had an overly oily day then I won’t apply a moisturizer and re-assess my skin in the morning. To clarify, I’m not a dermatologist and this should not be taken as professional advice. This is simply my thoughts on getting clear and healthy skin that can apply to your own skin type. I would love to know if you’re using any serums as well! Do you have any recommendations? **Kiehl’s are not all-natural skincare products but I will continue to use them until I can find natural alternatives. I got sensitive skin too. Good thing we got this option now. Thanks! It’s totally worth it and can last me around 5 months! I can do that, for sure!